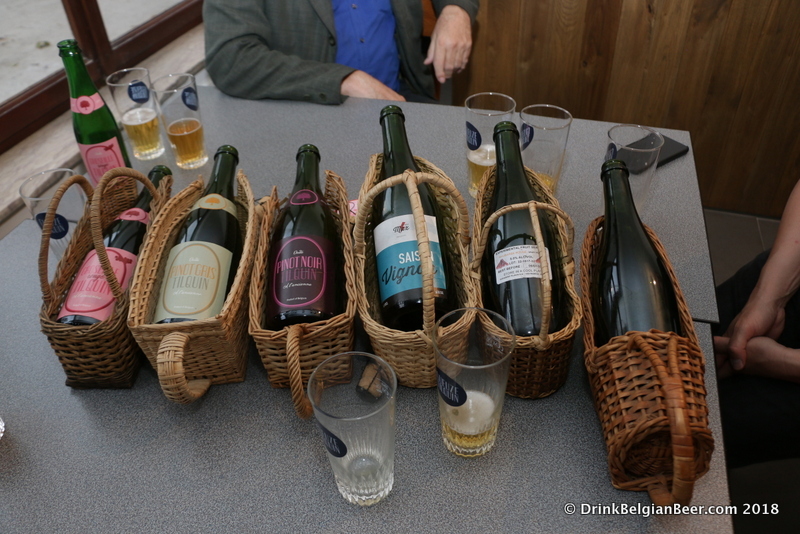 As Gueuzerie Tilquin approaches its tenth anniversary this March, there can be no question that the esteemed lambic blendery has seen great success in its first decade. I paid a visit to Founder/Owner/Master Blender Pierre Tilquin in late August 2018, to catch up on how things are going, and to discuss the new beers that have been created recently, as well as future plans. Lambic aficionado Patrick Van der Spiegel of Halle joined me and Pierre for the tour and tasting. Van der Spiegel created the Facebook and Instagram pages, “The Land of Geuze.” The Facebook page is linked here and and the Instagram page is here. 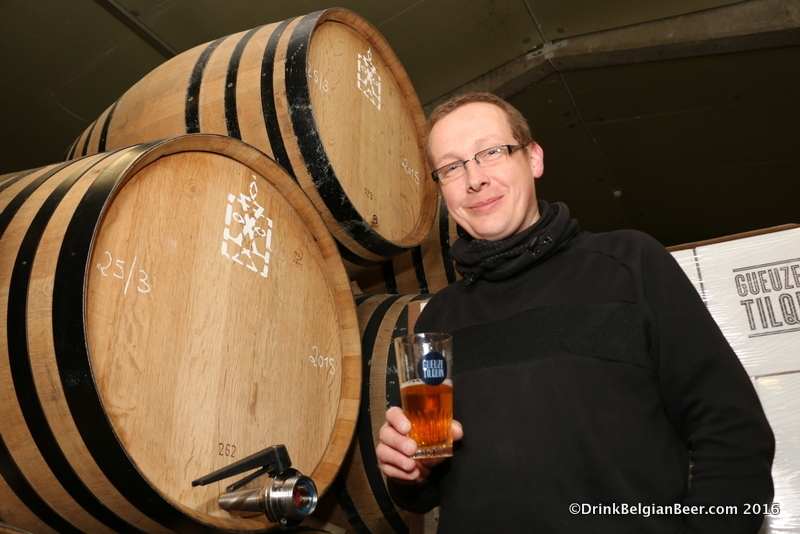 Gueuzerie Tilquin, located in Rebecq in the Province of Wallonian Brabant, first filled barrels with wort on March 12, 2009. That first wort was from Brouwerij Boon, and the next day, Tilquin took delivery of a batch of wort from Brasserie Cantillon. Then, on March 18, 2009, the first batch of wort from Brouwerij Lindemans arrived. 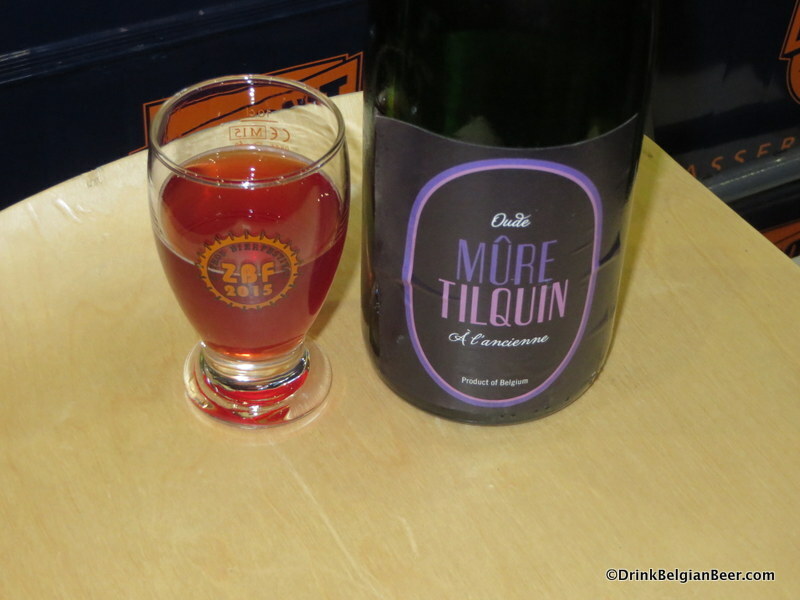 Tilquin was the first new lambic blendery to open since Geuzestekerij De Cam opened in Gooik, in the Province of Flemish Brabant, in 1996. My first visit to Tilquin was in late May, 2010. 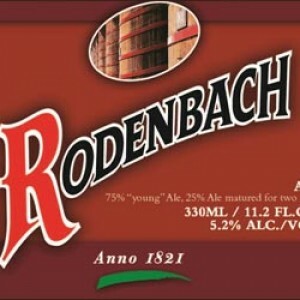 Lambic blenderies purchase wort, or unfermented beer, directly from lambic breweries during the winter brewing season, and then add this wort immediately to their own barrels for aging, to produce what will in time become lambic. 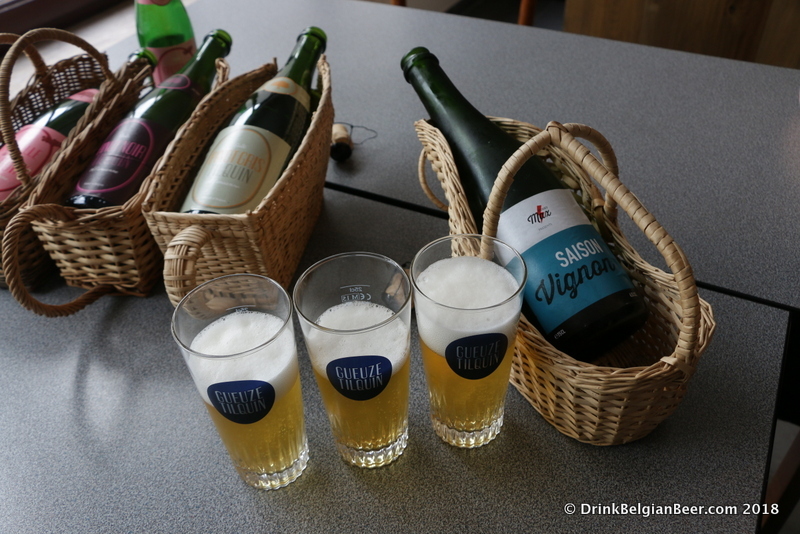 Lambic of different ages, primarily 1, 2, and 3 year old, can be blended together to make Oude Gueuze, or lambics of different ages can be blended with fruit to produce fruit lambics. “As you know, we started with 222 barrels in the 400-liter size (about 3.4 U.S. barrels each) in 2009. Now, we have 575 barrels of 400-liters,” says Pierre Tilquin, as I toured the blendery again, for the seventh or eighth time since it opened. 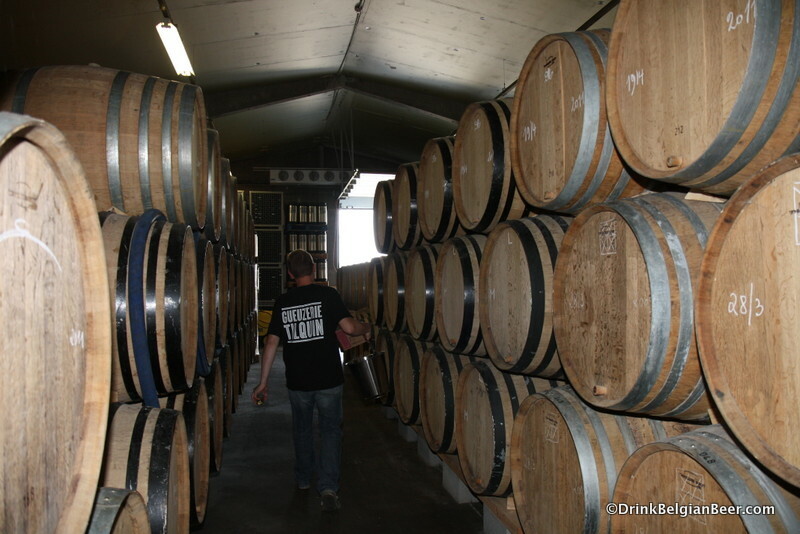 Rows of 400-liter barrels at Gueuzerie Tilquin. 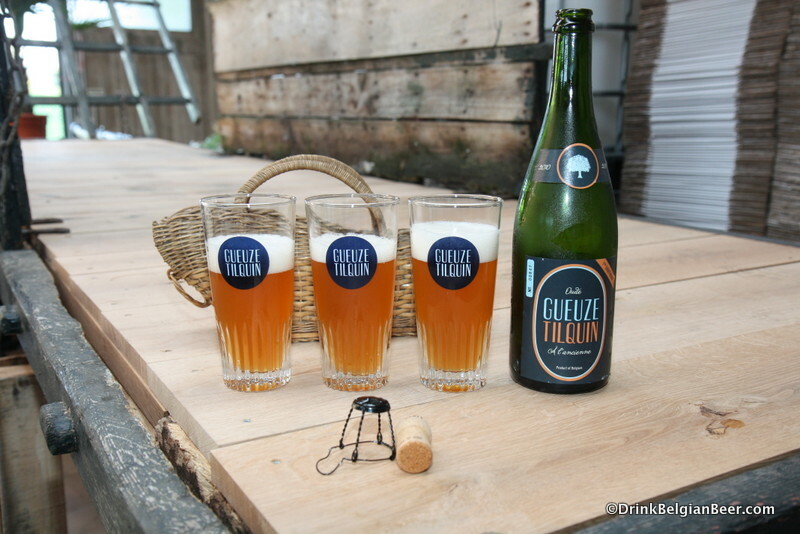 Gueuzerie Tilquin now uses wort from breweries Boon, Cantillon, Girardin, and Lindemans in its blends. 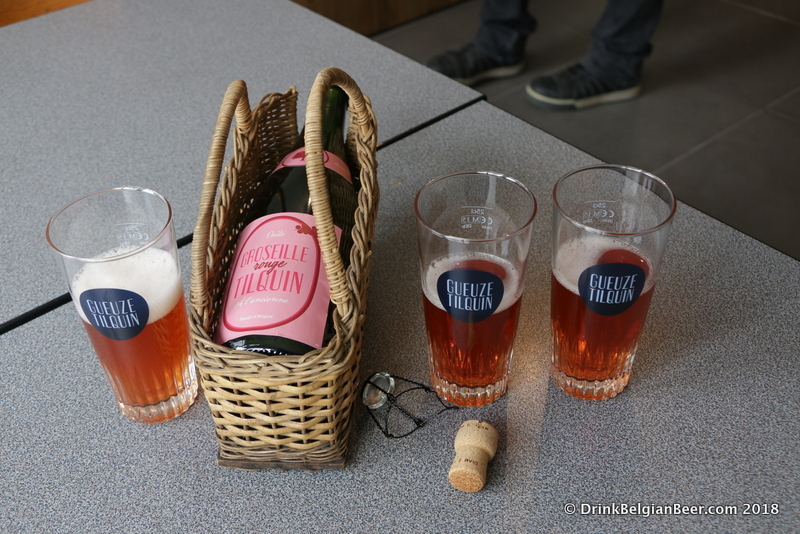 Tilquin, in fact, is the only other lambic maker that Brasserie Cantillon will sell wort to, and it’s just a couple of brews per year: “I receive two brews of 62 hectoliters each season from Cantillon, so that is 124 hl (about 105.6 U.S. barrels) in total. I only use Cantillon as a three year lambic in my blends, as it adds a lot of complexity,” Tilquin remarked. Oude Gueuze Tilquin à l’ancienne, batch one. 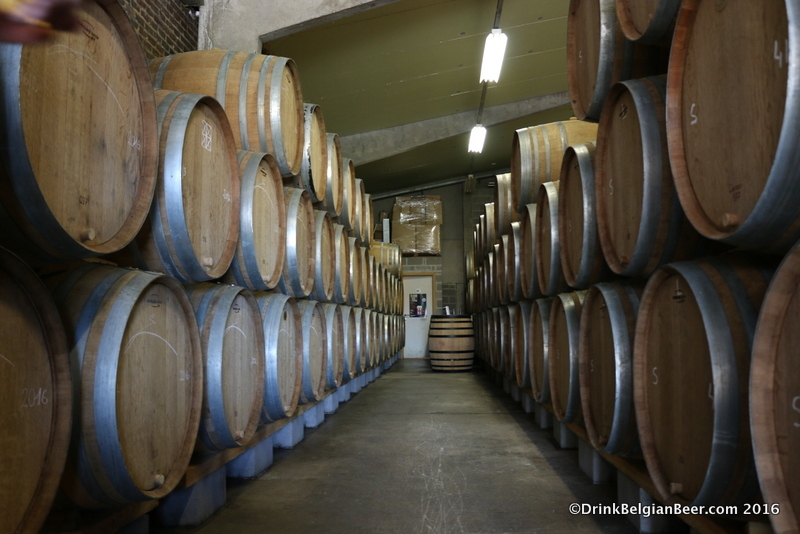 The actual size of the blends is a little less due to the fermentation as well as evaporation in the barrels: “With a 400-liter barrel, we have a yield of an average of 380 liters of lambic, so we blend the contents of 10 barrels together to fill our 38 hectoliter blending tank with 3800 liters of lambic,” (38 hectoliters, about 32.4 U.S. barrels) Tilquin remarked. 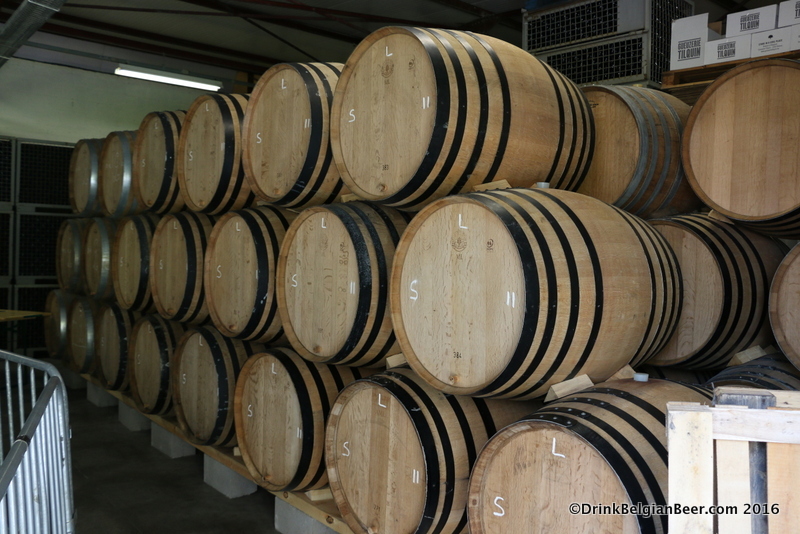 Rows of 400-liter barrels at Gueuzerie Tilquin in 2016. In mid-January 2019, Tilquin took delivery of some new 600-liter barrels, with the aim to replace some of the oldest 400-liter barrels at the blendery. He also acquired some 220-liter barrels. “These smaller barrels will be used only when we don’t have enough wort to fill a full 400-liter barrel when receiving wort, so that we don’t have a half full 400 liter barrel. I also bought some 500-liter barrels, with stainless steel openings on the top of the barrels, to make the fruit experiments larger,” he commented. 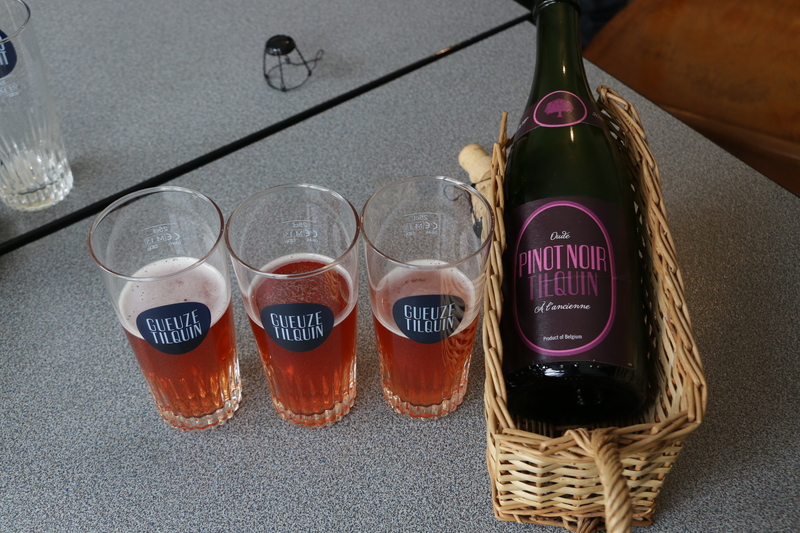 Pierre Tilquin has been doing a lot of fruit beer experiments in the last few years. 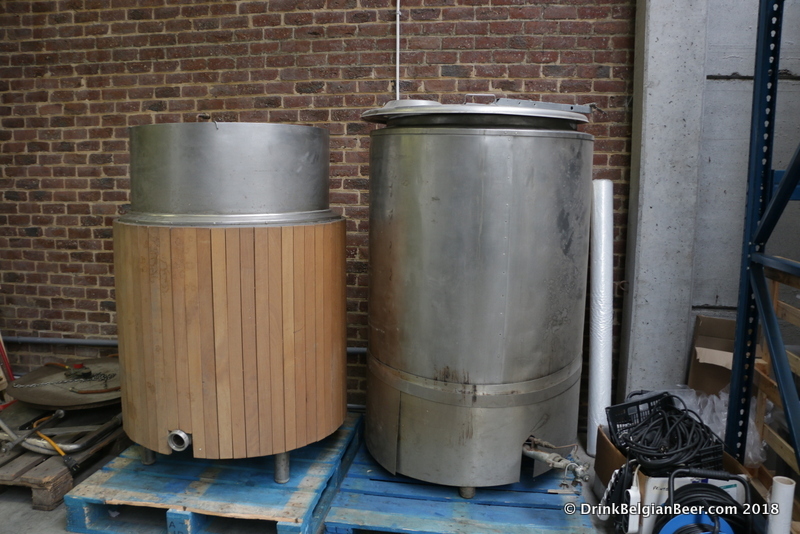 Gueuzerie Tilquin now has a total of 18 stainless steel tanks in the 20 hectoliter size, as well as a main blending tank of 38 hectoliters, and a smaller one of 27.5 hectos. The more tanks you have, the more experiments you can do! Oude Groseille Rouge Tilquin à l’Ancienne, from Gueuzerie Tilquin. 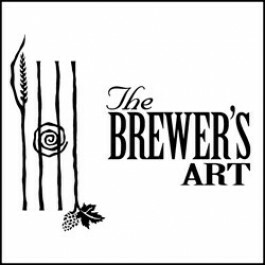 As of early February 2019, neither the new black currant or the new wild blueberry lambics have been bottled yet. “These fermentations take time, but we hope that both will be ready for release in September,” Tilquin says. Oude Pinot Gris Tilquin à L’Ancienne from Gueuzerie Tilquin. Oude Pinot Noir Tilquin à l’ancienne, 2018. Oude Pinot Noir Tilquin à l’ancienne, batch 3, bottled January 4, 2018. As you can see from the videos, there are no carbonation issues with the 2017-2018 season beers! I enjoyed a bottle of the batch 1, Moeder Lambic anniversary Pinot Noir in 2017, and thought it was a fantastic, complex, fruity lambic. I found the 2018 version, bottled on January 4, 2018, to be just as good. Note that the recipe has changed a bit since batch 1, namely, that batch used 350 grams per liter of grapes and had an alcohol content of 7.7%. Batch 3 has a slightly higher alcohol content, and contains less fruit per liter. No matter, both are excellent beers, well worth seeking out. In 2018, pallets of Groseille Rouge, Pinot Gris, and Pinot Noir were shipped to countries such as Canada, the USA, Japan, Italy, Norway, Sweden, and more, so the new beers could be released on the same day, September 1. Tilquin also held a release at the blendery the same day, with limits of one bottle each per person of Pinot Gris, and the 75 size of Groseille Rouge, as total production was only 5,000 bottles of each. For Pinot Noir and the small bottles of Groseille Rouge, the limit was two per person. 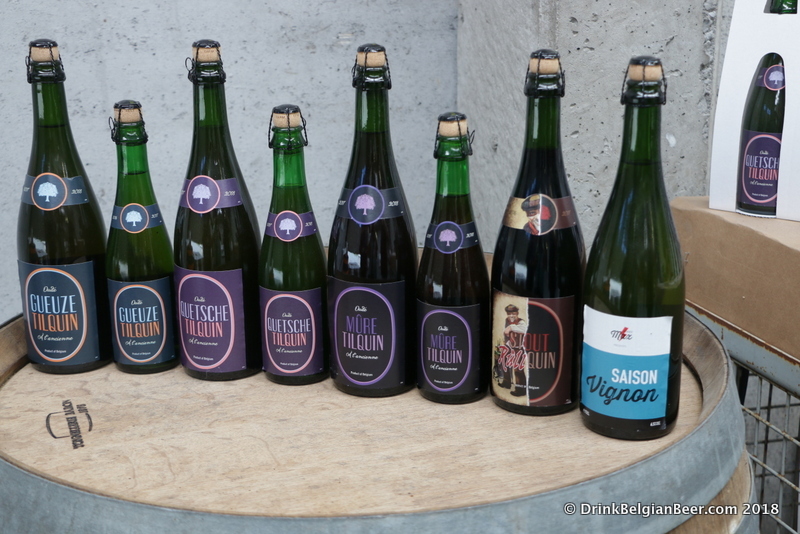 I was at 3 Fonteinen’s Open Door days that Saturday, and I heard that a big crowd was on hand to buy bottles at Tilquin. Given the difficulty in finding these three beers, my suggestion to lambic lovers out there is: buy them when you see them! Important: to you Mure and Quetsche drinkers out there, don’t panic! 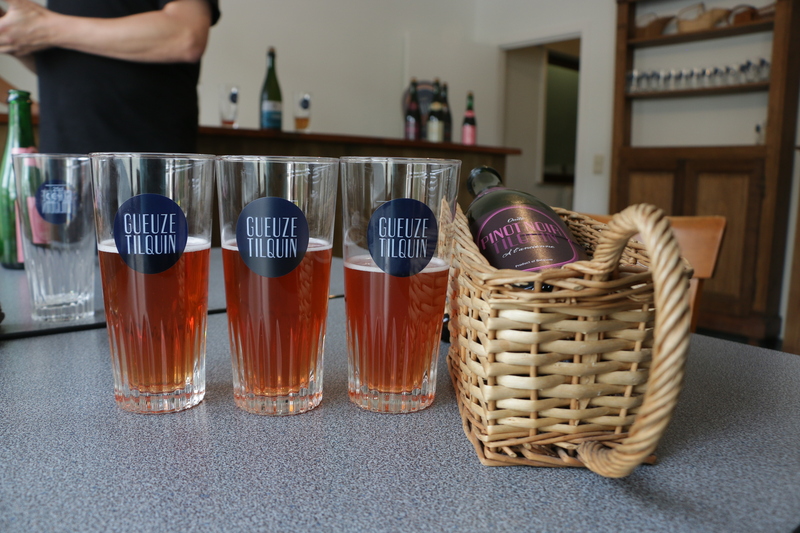 These brews are now a permanent part of the Gueuzerie Tilquin range. They aren’t going anywhere. Also, sadly, I do have a little bad, short term news: for the second year in a row, for the 2018-2019 season, there will once again not be a Prunes de Namur version of the Quetsche. The reason is the weather: during the spring of 2017, the flowers from these trees were frozen during an early spring freeze. Then, the summer of 2018 was very hot and dry in Belgium, and there was not enough rainfall to encourage the growth of these Belgian plums, so most simply fell off the trees. So the plums for the Quetsche will continue to come from the Alsace in France until a good harvest occurs in Belgium. “It’s a pity, as I prefer the Prunes de Namur plums over the ones from Alsace,” Tilquin commented. 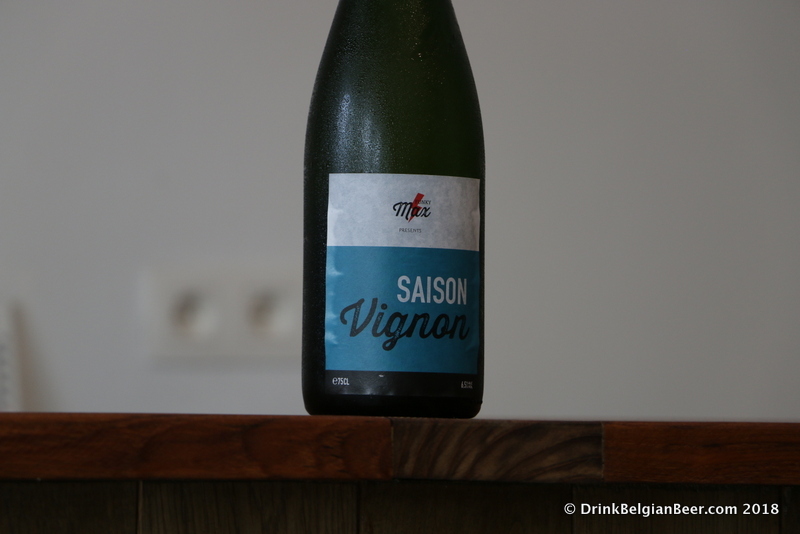 Saison Vignon, a blend of saison from Funky Max, blended with a small amount of lambic and aged for three months in barrels. Saison Vignon from Funky Max and Gueuzerie Tilquin. 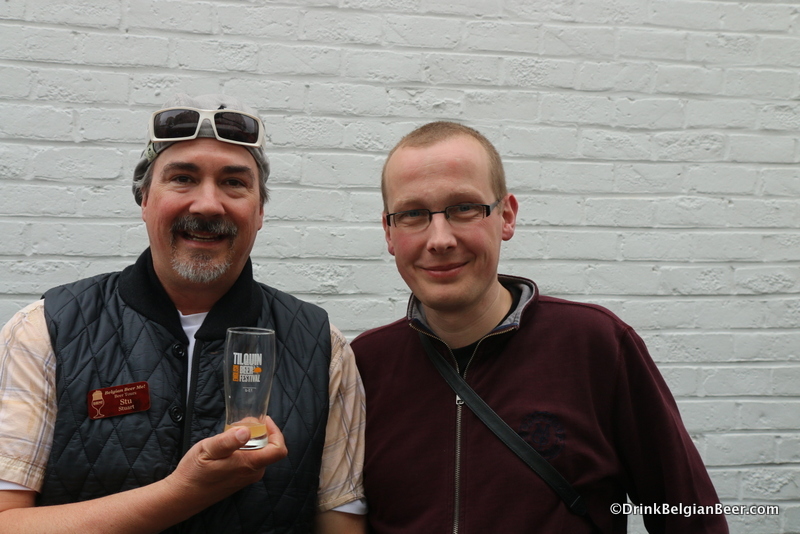 Lambic lover Patrick van der Spiegel (left) with Wanne Madaljins of De Lambikstoempers. 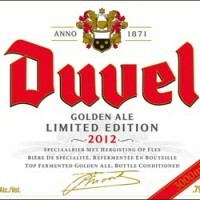 “It’s a really nice one, so easy to drink, and yet it doesn’t taste to its 6.5% abv,” Van der Spiegel remarked. I have no problem in confessing that I love dry, funky saisons, almost as much as lambics. I hope Saison Vignon becomes a readily available brew in the future, especially once newer batches with a higher lambic content are rolled out. Bring it on. A lineup of beers that we tasted during my visit in late August 2018. The two on the far right are experimental brews. 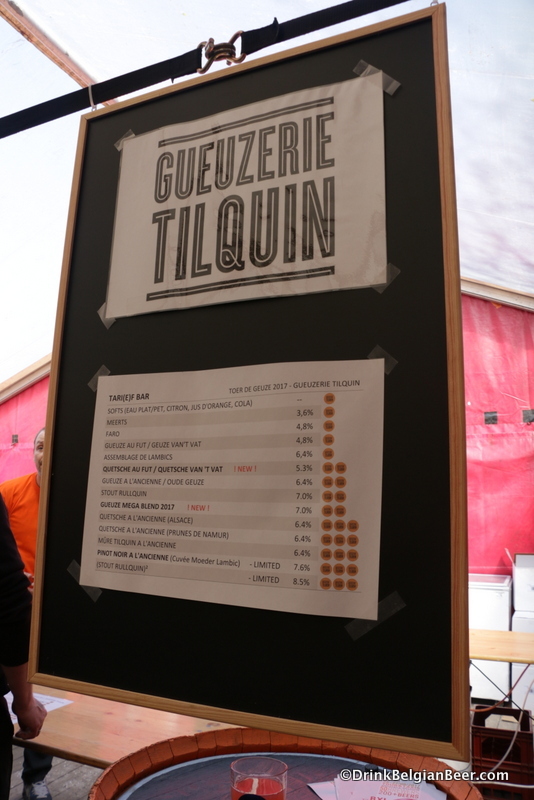 Some of the Tilquin beers available at the BXL Beer Fest in August 2018. 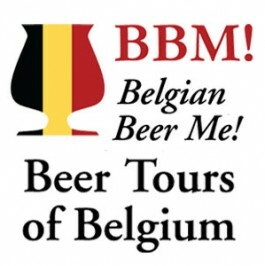 I attended the BXL Beer Fest in 2018, and can attest to the great variety of beers on offer there from Tilquin and other breweries. 300 different beers from 60 breweries across the globe, to be exact, were on offer. See here for an article about the event. A small 400-liter brewhouse that may be used as a lambic brewery in the future. As we walked through the blendery, Tilquin pointed out a small, 400-liter brewhouse that he purchased from a brewery in France. 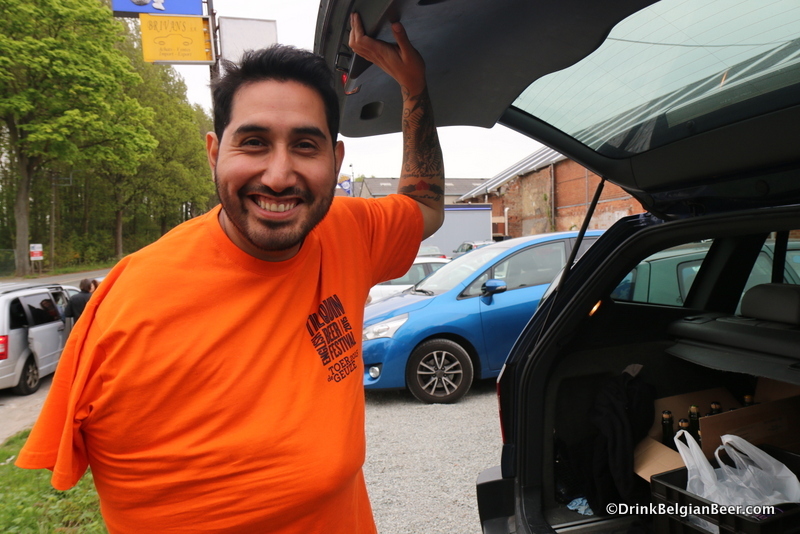 “I would like to start a small lambic brewery here sometime in the next couple of years. It will be just an experiment, and a separate project from the blendery. I would add a small coolship outside as well, and do the entire process here. I might have to increase the size of the building a bit to do so. This would be a long term project over say, 3, 4, 5 years. 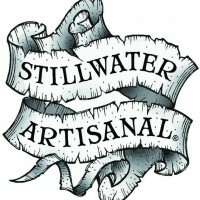 I want to slowly start to brew and gain confidence in my brewing abilities, and elaborate from there. If I could brew about 12 times a year, I could build up a little stock of 100% Tilquin lambic. Each brew would only fill one of the 400-liter barrels here, so this is just something I’d like to do to create something new. Note that I do not want or plan to change the blends we make here, from the four lambic breweries. These blends work so well that I would never want to do that. I’m very lucky to be able to use four different lambics, as each one gives something to the taste, making for very rich blends.” Tilquin did not have time to install the brewery for the 2018-2019 season, so this is something that will have to wait at least one more season. You might ask: who helps Pierre Tilquin taste all of those experimental beers? After all, it would be quite a few beers to taste on a regular basis, even for he and his four colleagues. 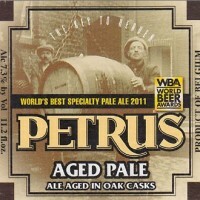 Also, to get an objective opinion, sometimes its good to seek comments from outside the confines of your own brewery. Luckily, Pierre Tilquin has a group of friends that he has known for a number of years, known as the Tilquin Enthusiasts. 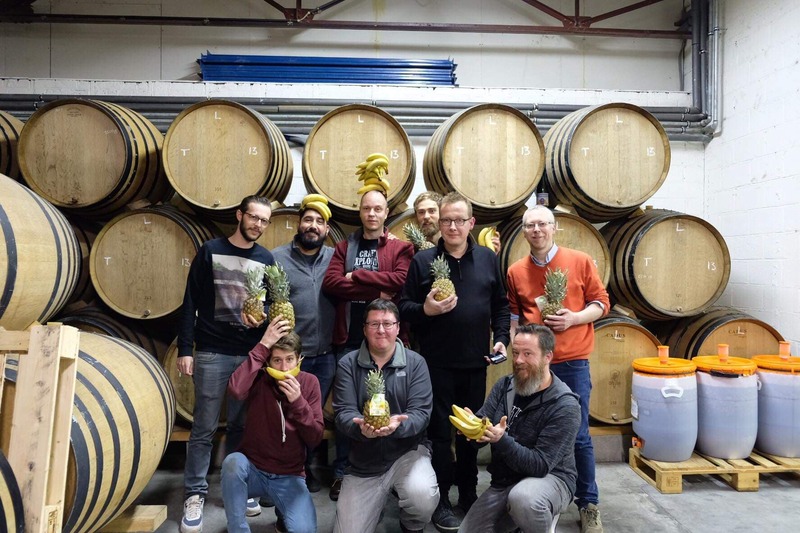 These friends volunteer their time to help out when some extra manpower is needed, and have the added benefit of being in the inner circle that gets to taste Tilquin’s experimental beers. One of the better known members is a big fan of lambics, especially those of Gueuzerie Tilquin, Kevin Desmet. 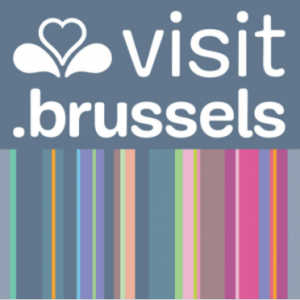 Kevin is a co-founder of the aforementioned BXL Beer festival, and also an admin on the Tilquin Enthusiasts page on Facebook. Here, some of the founding members of the Tilquin Enthusiasts. On the front row, far right, is Kevin Desmet. Rich Soriano is in the back row, second from left. This is a shot taken when they made a batch of Tilquinananas. Rich Soriano, Founder of the Tilquin Enthusiasts, at Toer de Geuze 2015. 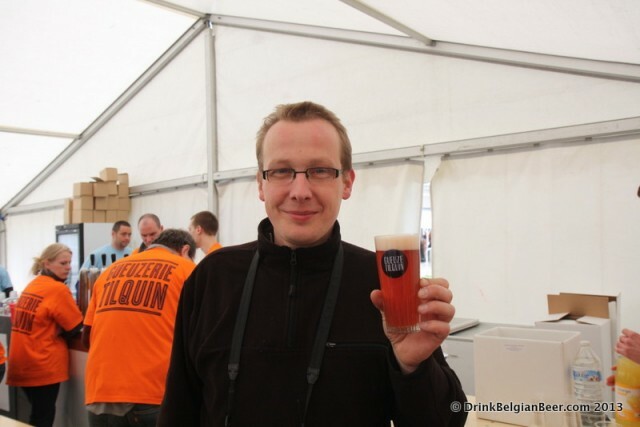 I asked another friend, Rich Soriano, an American who is very passionate about lambic beers, who has lived in Belgium for a number of years, for his take on being the founding member of Tilquin Enthusiasts. He replied: “I first met Pierre in 2014. Tilquin gueuze by this time was one of my top beers, and he just so happened to be open Saturday mornings. 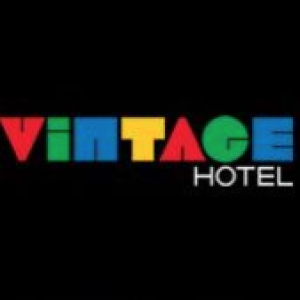 I started going there pretty regularly. Another Tilquin Enthusiast admin, Seb, would usually be there, and we’d stand in the middle of the the then tiny, very cold blendery, drinking random beers and yelling terrible beer ideas at Pierre (who would of course shoot them down…they really were bad ideas!). 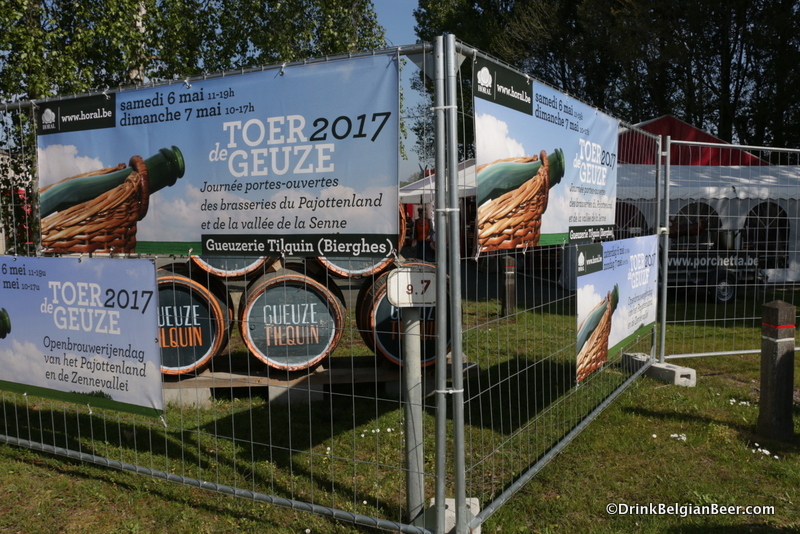 A list of the available beers at Gueuzerie Tilquin during Toer de Geuze 2017. It was a great lineup! 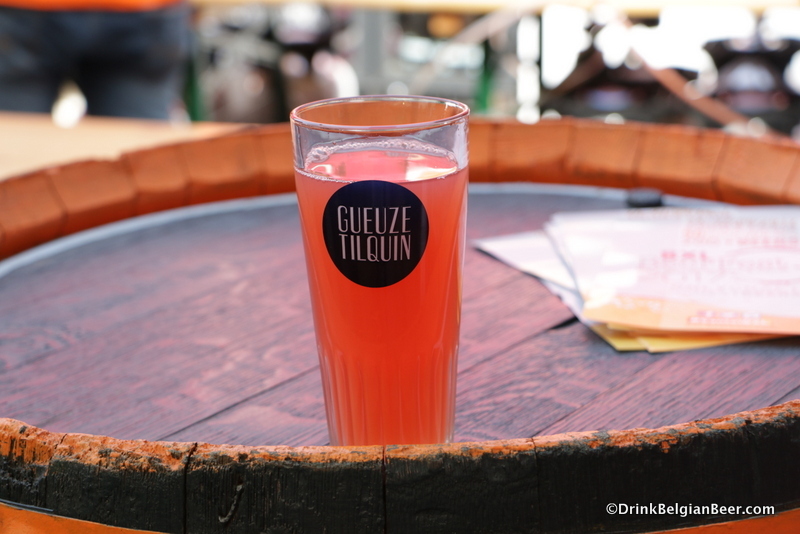 For anyone visiting France the last weekend of April, the 27th and 28th, Gueuzerie Tilquin will be present at the Lyon Bière Festival. 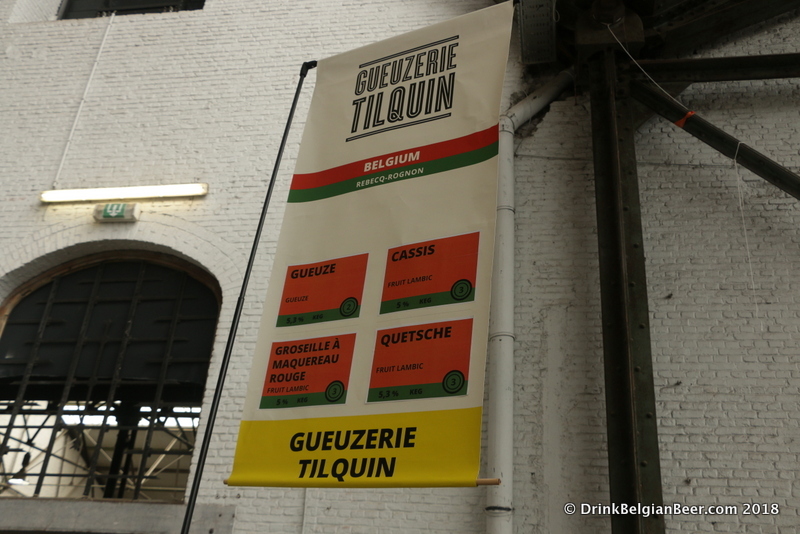 Due to that event, Tilquin will not be present at the Zythos Beer Festival in Leuven this year. 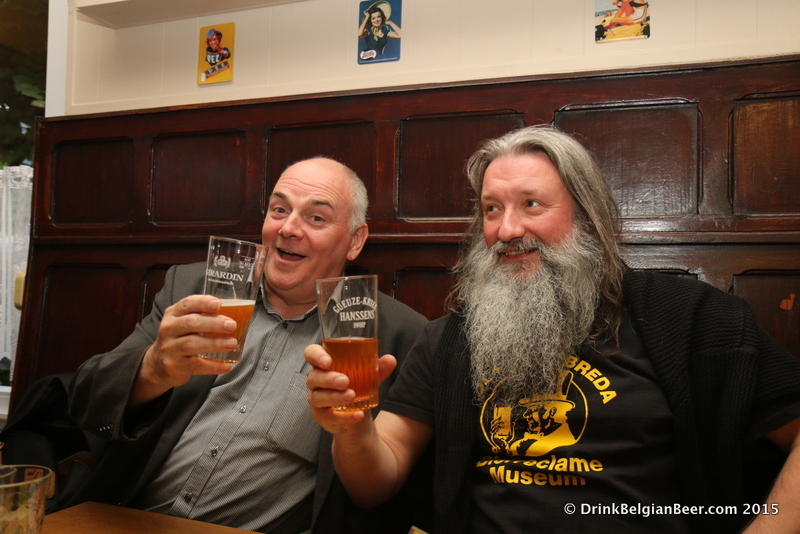 Pierre Tilquin of Gueuzerie Tilquin, right, and Stu Stuart of Belgian Beer Me! Beer Tours, left.